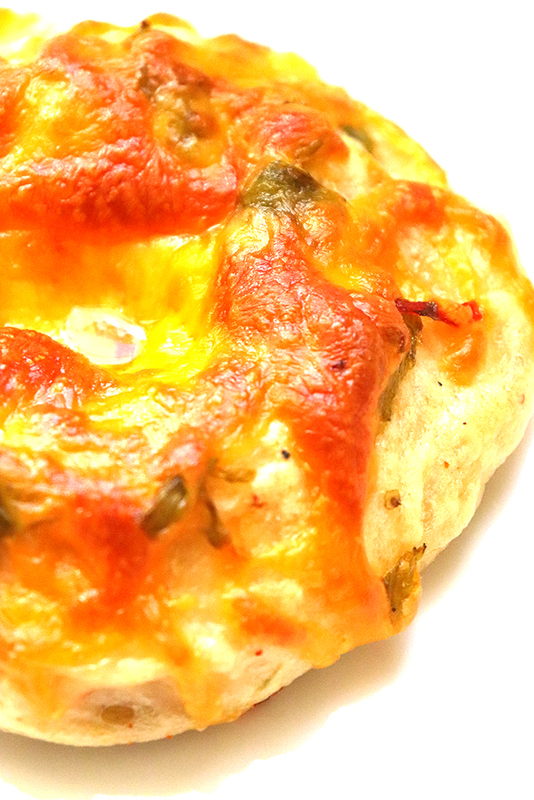 Are you looking for a recipe for a green chile cheese bagel? Keep reading for step-by-step instructions! When I first moved to Albuquerque, I lived in an apartment within walking distance to an Einstein Bagels. One of their featured bagels in New Mexico is their Green Chile Bagel, made with green chile and lots and lots of cheese. It’s a tasty bagel and a regional favorite! The first time I tried it, I knew I wanted to recreate a version at home – and share it with you! This bagel is savory, fluffy, a little spicy, and sharp. It will quickly become your favorite breakfast bread! Start by adding warm water, active dry yeast, and sugar to your electric mixer. Let sit for 10 minutes, then stir in flour, green chile, and salt. 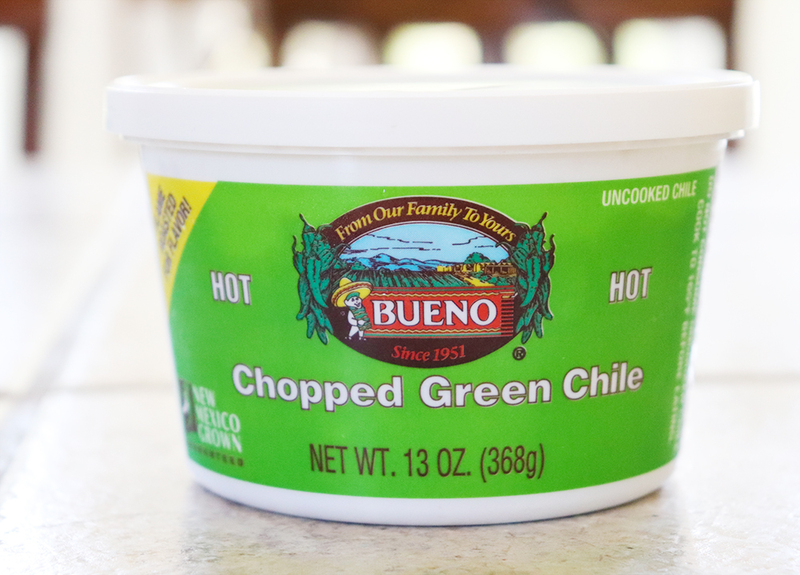 I used chopped frozen green chiles from Bueno (found in the freezer section at the store), but fresh green chiles are a great option, too! 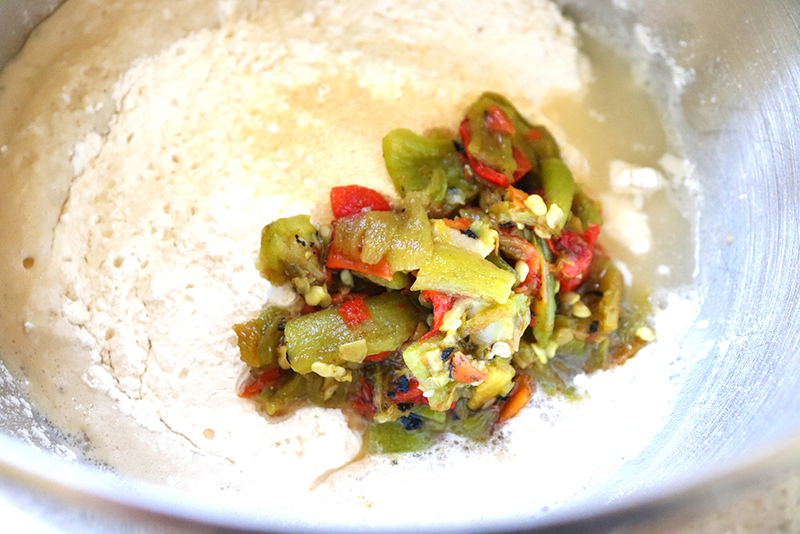 Mix with the dough hook until dough is formed, then let mixer knead the dough for an additional 5 minutes. Drape with a towel, and let sit for one hour. Turn dough onto floured surface and separate into 8 equal sized balls. Place on greased baking sheet and cover. Let rise for 15 minutes. 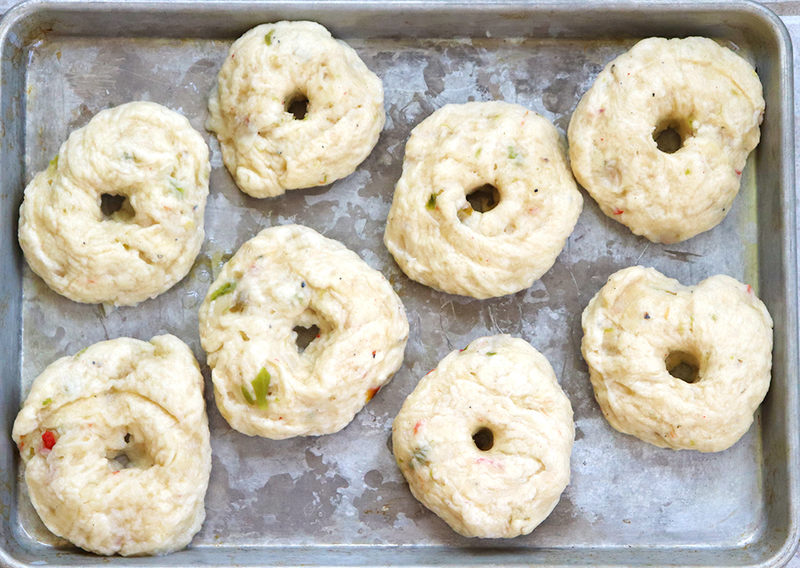 Poke holes into dough to form the center hole of the bagel. Cover and let rise for an extra 15 minutes. Meanwhile, bring a large pot of water to a boil. Place bagels, in twos, into the boiling water, for 2 minutes per side. Remove from water with a slotted spoon, and place back onto baking sheet. 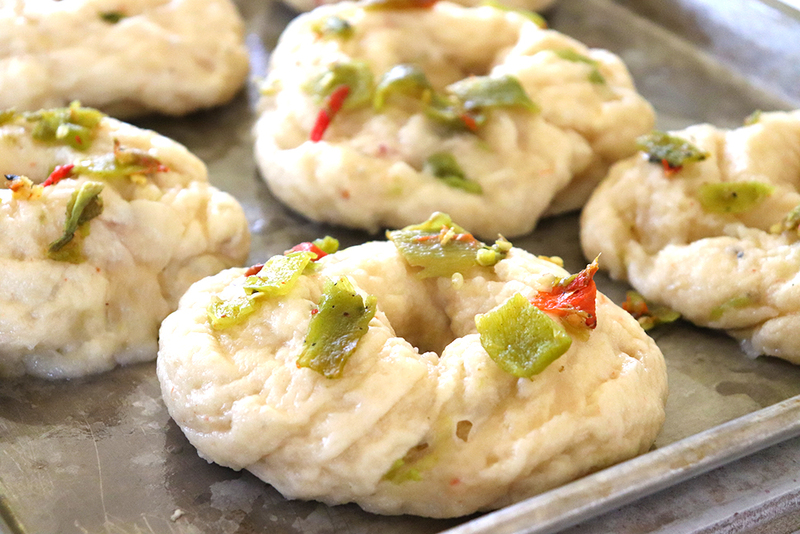 I like to top the bagels with a little extra green chile, but this is optional! Then these get baked at 415 degrees for 25 minutes, until cheese is melted and starting to brown. Then you get to enjoy these beauties! In the bowl of your electric mixer, combine warm water, active dry yeast, and sugar. Stir and let sit for 10 minutes, until it gets foamy. Add in flour, green chile, and salt. Mix with dough hook until dough is formed, then continue to mix for 5 minutes. If the dough is too sticky, add in more flour, or if dough is too dry, add in a little bit of water, until dough is elastic and manageable. 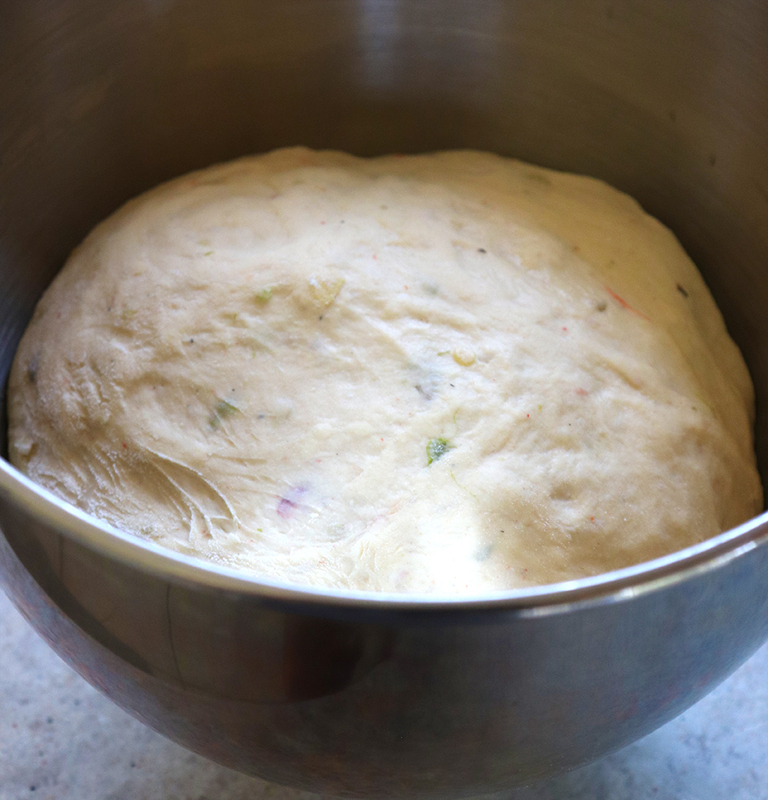 Drape towel over the mixing bowl and let dough rise for one hour. 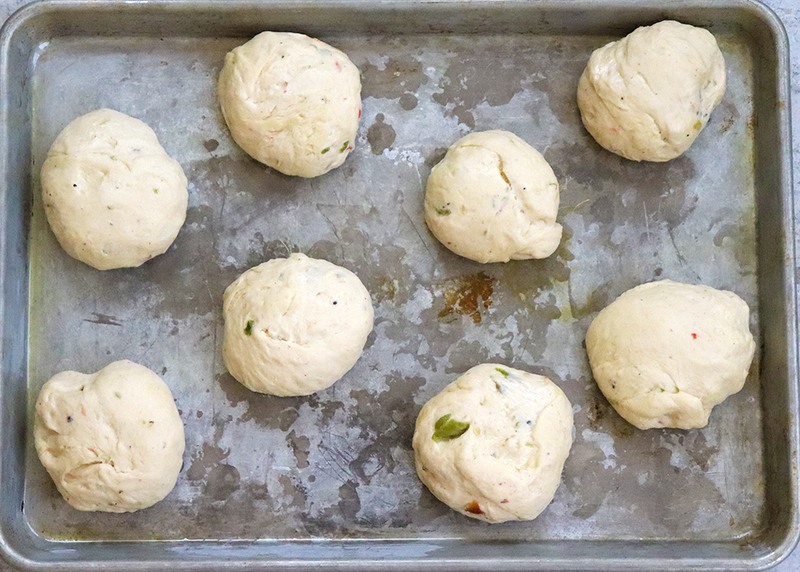 Turn dough onto floured surface and separate into 8 equal-sized balls. 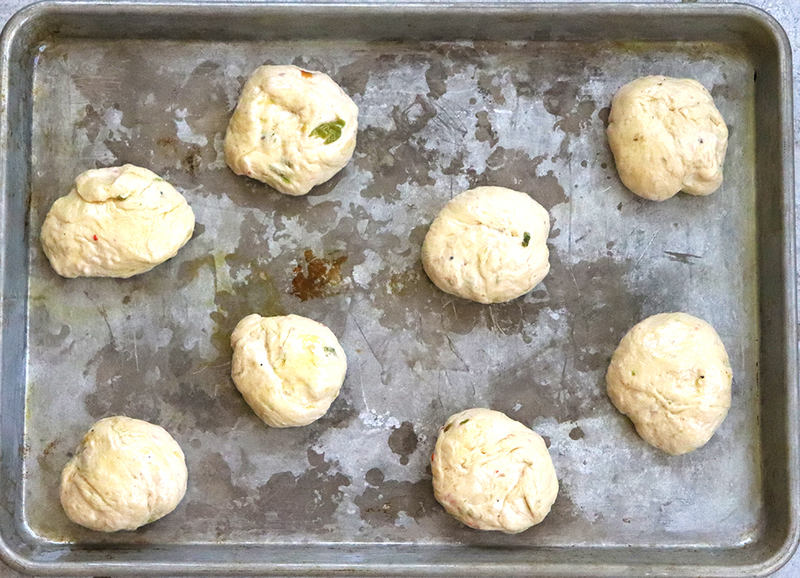 Place onto greased baking sheet, cover, and let rise for 15 minutes. Meanwhile bring a large pot of water to a boil. Poke holes into the center of each ball, forming the center hole of the bagel. 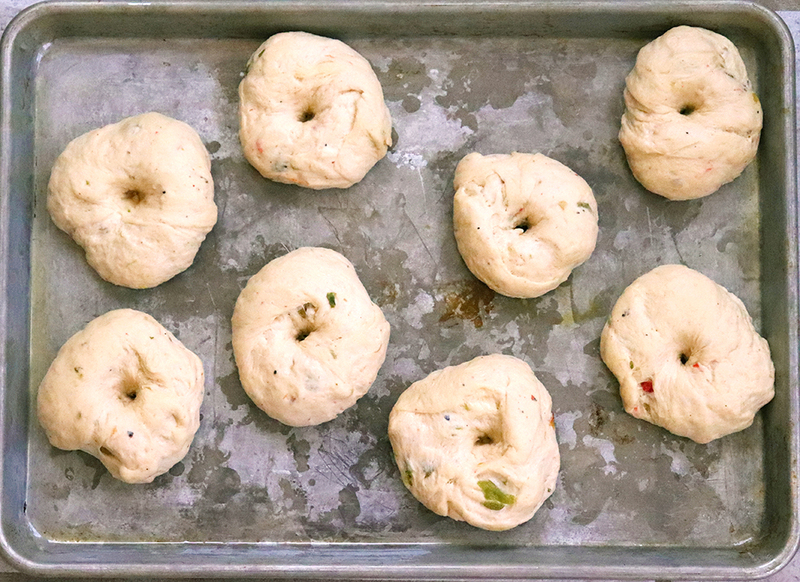 Repeat with all bagels, then cover and let rise another 15 minutes. Meanwhile, preheat oven to 415 degrees . Place bagels, two at a time, into the boiling water. 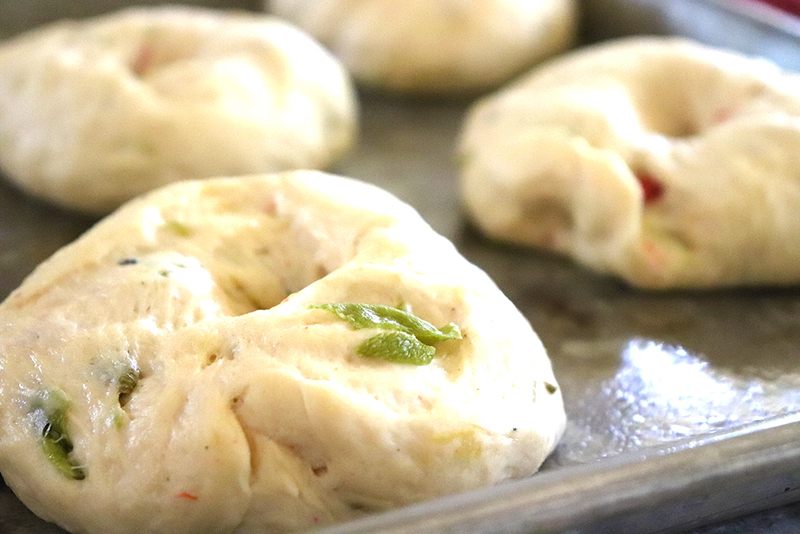 Boil bagels for 2 minutes on each side, then remove, drain, and place back onto baking sheet. Repeat for all remaining bagels. 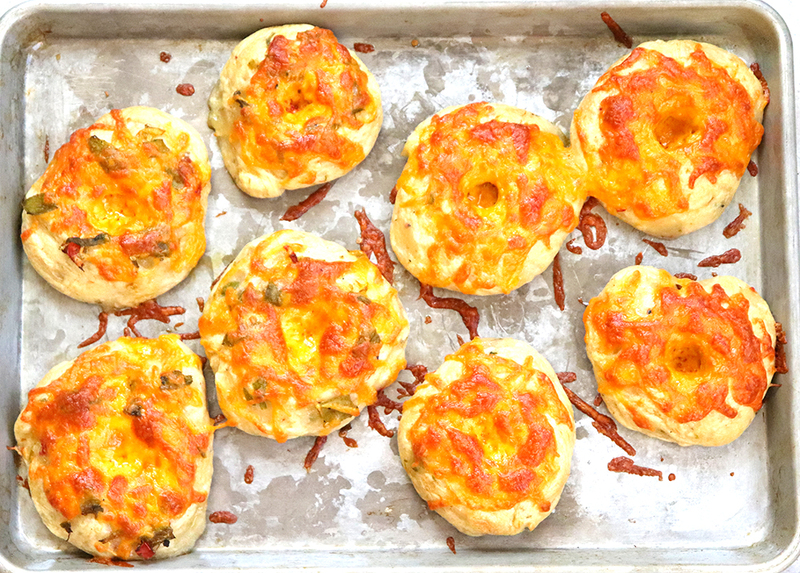 Top bagels with additional green chile (optional) and a handful of cheese to each bagel, then bake in preheated oven for 25 minutes, until cheese is starting to brown. 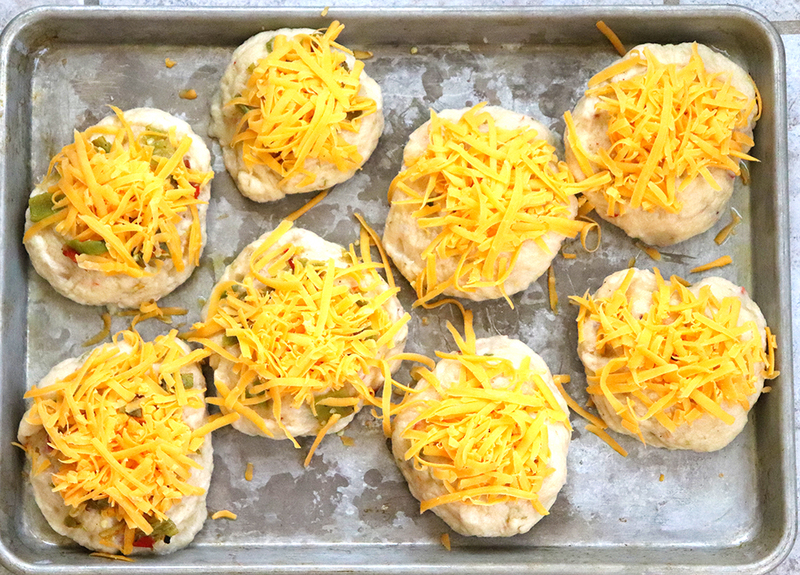 Save this recipe to your favorite Green Chile board, so your followers can enjoy these, too! Just click on the image below. 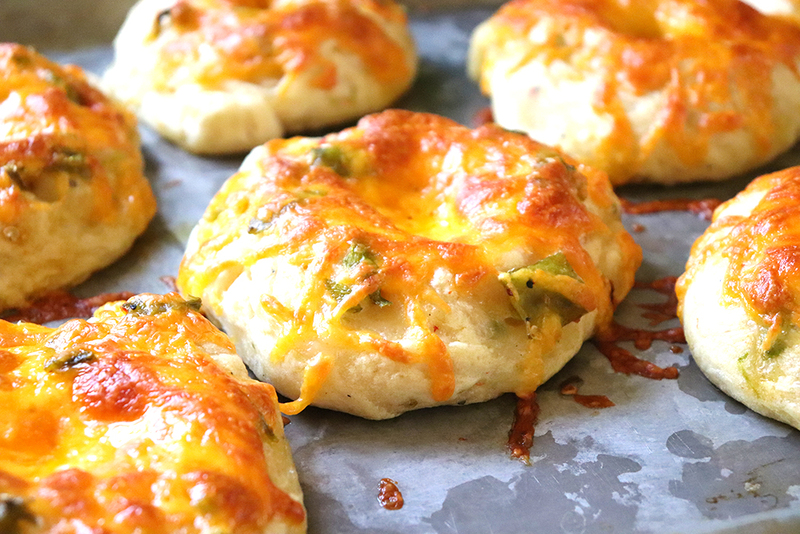 I hope you love these green chile cheese bagels as much as I do! They are great eaten as is, or sliced with a little butter, OR, sliced with a piece of sausage and a pan-fried egg in the middle. I actually ended up cutting up a couple leftover bagels and serving it with an oil dipping sauce before a meal. Tasty! So, there is no wrong way to eat these bagels. Enjoy!